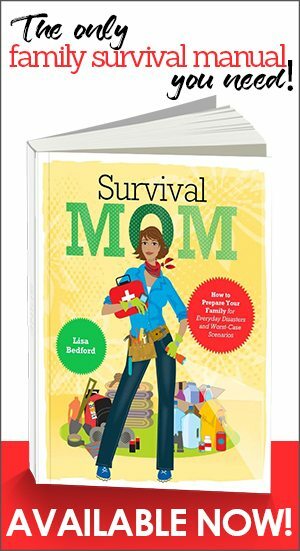 When the winds and torrential rains of Hurricane Harvey slammed our home and left us in the dark, I didn’t reach for candles and matches or one of my flashlights. Instead, I chose something that didn’t use an open flame to provide light; something that didn’t require batteries. 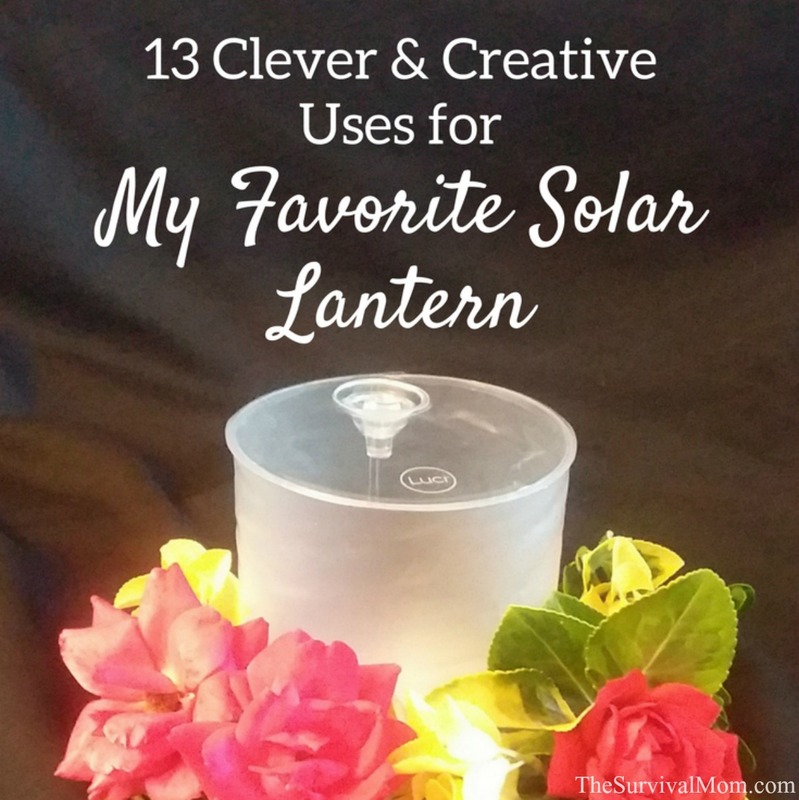 I opted for the Luci Solar Lantern, one of my very favorite Survival Mom products and one that I now represent as an affiliate. This inflatable lantern provides light in emergency scenarios, powered by a small solar battery which quickly charges from the sun or just indoor lighting. A full charge lasts about 12 hours, and because it’s inflatable, it’s easy to deflate and store in small spaces. I’ve even added a Luci to a small, vacuum sealed emergency kit I made for my kids. With just a few puffs of air, it reinflates and is ready to become a lantern again. When I needed it for reading, I turned it upside down and created a lamp for my reading area. It’s not often that I jump fully on board with a product but my family has had Luci lights around now for several months and they are a reliable source of light whenever we’ve needed one. 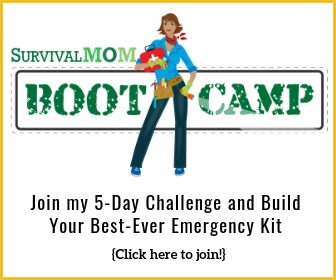 What more could you ask from an emergency preparedness product? I talked about the Luci and demonstrated some of its features in this recorded Facebook Live chat. My friend and assistant, Erin, took on the challenge of finding even more ways to put the Luci to work, and I’ve got to give her a lot of credit. These are creative and convincing for anyone wondering if a few Luci lights around the house might be a good idea. Here’s what Erin came up with. Use the Luci as a night light for a child’s room. With its 3 brightness settings, you can set it on Low — just enough light to provide comfort. With the Luci around kids, you won’t worry about a plug-in night light with a hot bulb and electric outlet, easily within reach of a young child. And, the Luci isn’t a fire hazard. If you have grandkids, this would be a great way to have the Luci for emergencies AND as a night light when they spend the night. Place a few Lucis along a back patio railing for nighttime BBQs and then one in the middle of each table. Safer than tiki type torches — no fire hazard, and you’ll use them again and again. These are great gifts for kids and teens. If you are going to read under the covers at night, this is better than a flashlight with no expensive batteries. If you fall asleep while the Luci is on, there are no dead batteries to replace. On road trips you can charge the Luci on the dashboard while driving during the day, and then have a soft light source for the kids while driving at night. This is perfect! Kids can read, play games, etc. without the car’s overhead light on, distracting the driver. Great for hotel rooms, where we all can wake up a bit disoriented. Place the Luci on the bathroom vanity, on its Low setting. Every camping family needs at least 2 or 3 Lucis. They are perfect for tent lighting, provide a light source at night while the family is playing cards or just visiting, and in between camping trips, you can easily store the deflated lantern with your camping/outdoor gear. Feeling creative? Hang a few Lucis with big ribbons from trees, gazebos, patio umbrellas for charming nighttime entertainment. The Luci can be used to create beautiful, luminous centerpieces for outdoor or dimly lit indoor weddings and parties. Attach a Luci to a bicycle for nighttime rides. It can light up the path ahead of you and is large enough to make the bicycle and rider visible to others. On Halloween, it makes a great trick or treating light! Wherever you would place a tiny tealight (real or battery), use the Luci light instead for a safer and long-lasting glow. 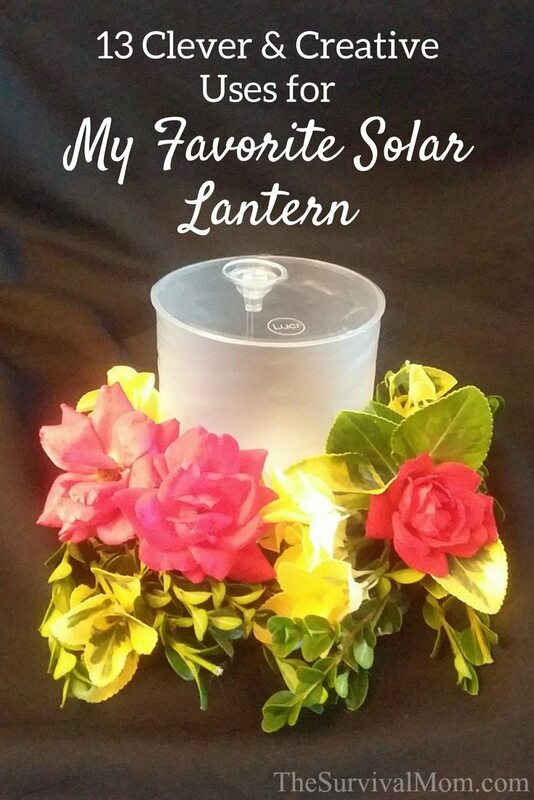 Because few people are familiar with the Luci Solar Lantern, they make great gifts for all sorts of occasions: thank you gifts (being the shining light of the PTA, you are the brightest teacher, etc. 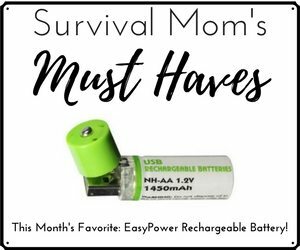 ), stocking stuffers, a Festival of Lights gift, or a thoughtful “I really want you to be prepared for emergencies” gift. Have an elderly loved one who could use some soft lighting during the night? The Luci lantern never gets hot and with its 3 settings provides just the right amount of light when needed. Looks like I might need to give Erin a raise — or maybe reward her creativity with a Luci light! For the best prices on the Luci, I like and recommend Survival Frog because they offer the Luci in multi-packs, which saves money. 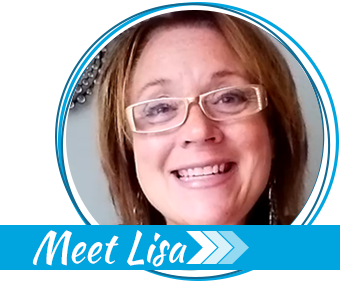 You can learn more about the Luci and order here. If you think of other creative ways to use the Luci, leave a comment below! I bought several of these off Amazon a few months ago. I remember after Hurricane Isabel, several homeowners in my town, whose houses had survived the hurricane, proceeded to burn down their own houses by using candles for light. I dread fires caused by candles and won’t have any real candles in my home. In addition to the white light Luci’s, I also bought some Luci “candle” inflatables that seem to have a central “flame” and cast “flickering candlelight” and they’re lovely. My only issue with using them has been recharging during rainy or cloudy autumn weather so i also have some hand crank lanterns. We first saw the Luci Light hanging on a sail boat slipped next to our boat, so we purchased 5 Luci lights, two for our boat, two for our bug out bags and one that changes colors. We toss that one in the hot tub, at night and it’s quite magical! It’s nice to see and read your review of the Luci solar light. I’ve owned mine for almost a year. It has been the best 17$ I’ve spent on preparedness/camping gear. I do a lot of camping and this little light provides more than enough real light to work, read or do things by; hands free. Such a great product that most of my friends have gone out and bought one or more because of its small size and many uses. I think these are a great idea for older people who just need a simple light source if they lose power. They’re nice and lightweight which is great for people who might use a walker and don’t necessarily have a free hand to carry a bulky lantern. I have had to get up many times over the years in the cold, pre-dawn hours to turn the overhead sprinklers on our vegetable and flower gardens when a surprise freeze threatened. A Luci Light would be a welcome partner as we continue to homestead in the American Redoubt. Luci sounds fantastic. We would use her camping and on our sailboat on a daily basis!! !